The UFC Fight Night 27 event that’s slated for Wednesday night in Indiana isn’t the only major event this week. The UFC 164 PPV will also take place this week on Saturday night and will take place in Milwaukee, Wisconsin, at the BMO Harris Bradley Center. The main event will feature a rematch from the final WEC event which took place in 2010 between a pair of lightweights in Ben Henderson and Anthony Pettis. Henderson lost a split decision to Pettis in their initial matchup, in which Pettis took the WEC lightweight strap from him. However, their paths have taken very different paths since that bout. Henderson hasn’t lost since that bout, and is the current UFC lightweight champion with three consecutive title defenses. Pettis lost his first UFC fight against Clay Guida, but has rebounded to win three consecutive bouts since then, including back-to-back TKO wins. The co-main event will feature a heavyweight bout between two former UFC champions. Frank Mir will be taking on Josh Barnett, who will be making his first UFC appearance since 2002. 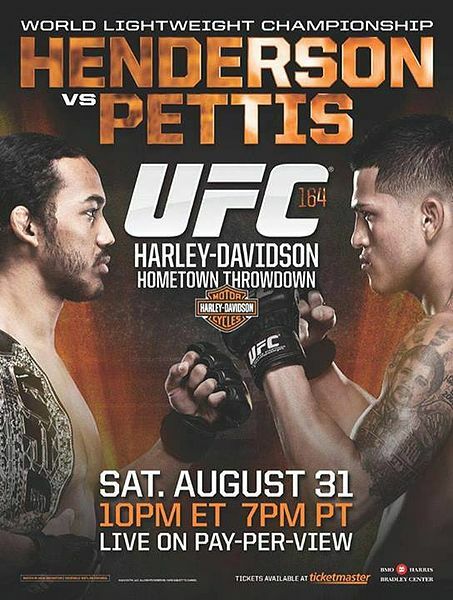 The UFC 164 preliminary fights will begin online at 5:30 p.m. ET and will transition over to the FOX Sports 1 channel at 8 p.m. ET. The PPV portion of the card will air in the customary 10 p.m. ET time slot.